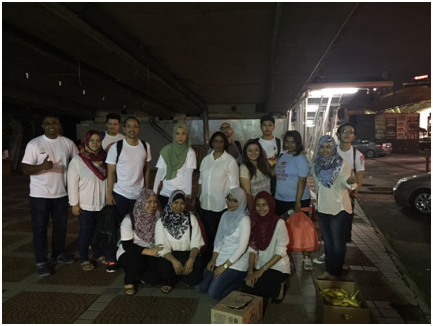 On 1st December 2015, Melorita’s team of 15, along with the Street Feeders of KL, headed out to the streets surrounding Central Market, Kotaraya and Jalan Pudu, to lend a helping hand to the homeless. With no home to go back too, no families, no good clothes to wear, their lives belong to streets and it is a daily battle of survival. We were briefed by the Street Feeders of KL to not only just distribute the food and drinks but also to spend some time interacting and talking to the homeless. As such throughout our 2 hour walk through the streets of KL, food and drinks were distributed, stories were shared, while we provided a listening ear. This month is all about giving and we had an amazing time reaching out to them. Thank you Street Feeders KL for the experience which we will all definitely remember and cherish. We all left the streets of KL that night with a tinge of shock that such a situation exist in our blessed country but with a sense of satisfaction that we were able to contribute in a small way and a promise that we must continue to give back in any way we can.